Continue without virtualized Intel VT-x/EPT? And if you choose No it throws up an error. You need to choose Yes before it will let you power on the VM. This is a problem of my own making, a while ago I was trying to enable Hyper-V on a Windows 8 VM, and needed to make a change in my VMware environment so I could add this Windows feature to the VM. I enabled the change globally on the ESX host (Instead of just on the machines .vmx file which would have caused me less problems!). So I needed to remove the change I made. 1. Connect to the ESX host via SSH, and login. 2. 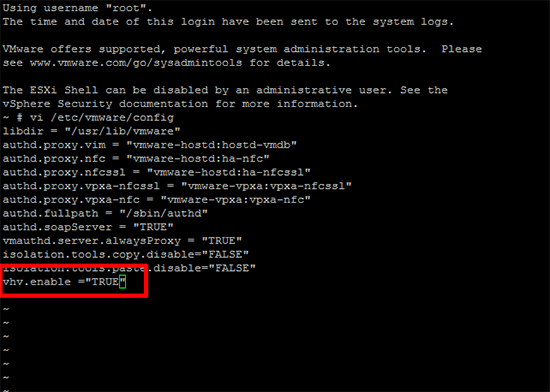 You need to edit the /etc/vmware/config file, and remove the line I had added earlier [highlighted below].